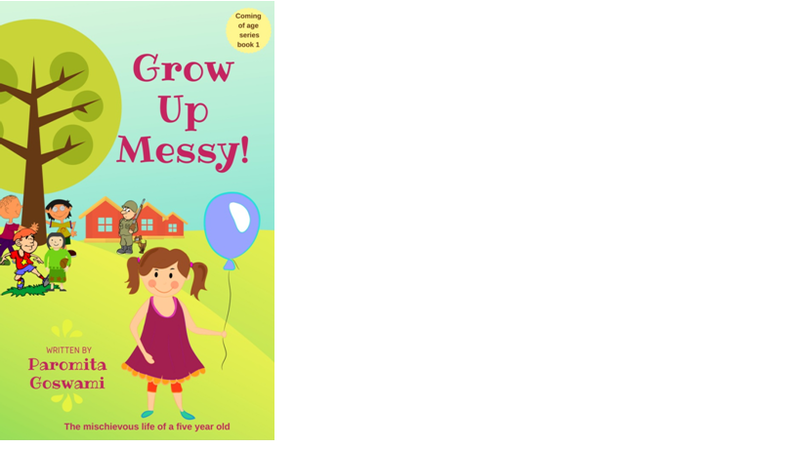 This is the story of a sweet naughty 5-year-old girl Misry who is called as Messy by everyone because of the mess she creates. Misry is the daughter of Anurag who works at Border security force and thus have to move to many places due to his dad'said work assignments. As expected, the story shows the world in the perspective of a 5-year-old, her naughtiness and her innocence. Like every other parent, her mother Madhavi sometimes says, 'Grow up Messy' because of the kids' naughtiness. Also, she loves the innocence, intelligence and energy of her daughter and prays inside her heart 'Never grow up, Messy'. That's very true of parenting right? Even though kids annoy us with their childish behavior, they are adorable too. We want them to become mature but worry that we miss their innocence and naughtiness. As I am already managing 2 year and 5-year-old boys, I could relate to this feeling. Misry is adorable and intelligent for her age. Her mother Madhavi shows good patience while managing misry and clarifying her doubts. Anurag is an ideal father and the way he deals the problem when misry stops going to school for a silly reason is very nice. The characters of misry's dadu and dadi, pallavi mashi, honey etc are portrayed very well and make the story strong. I loved reading this book in a 5 year old perspective and would recommend this to parents as well as children. The ending felt abrupt though it says to read second part of the book series. It might have been better. The book cover and title are apt. Ps. I have received this book from the Author for review and this is my unbiased opinion on the book.